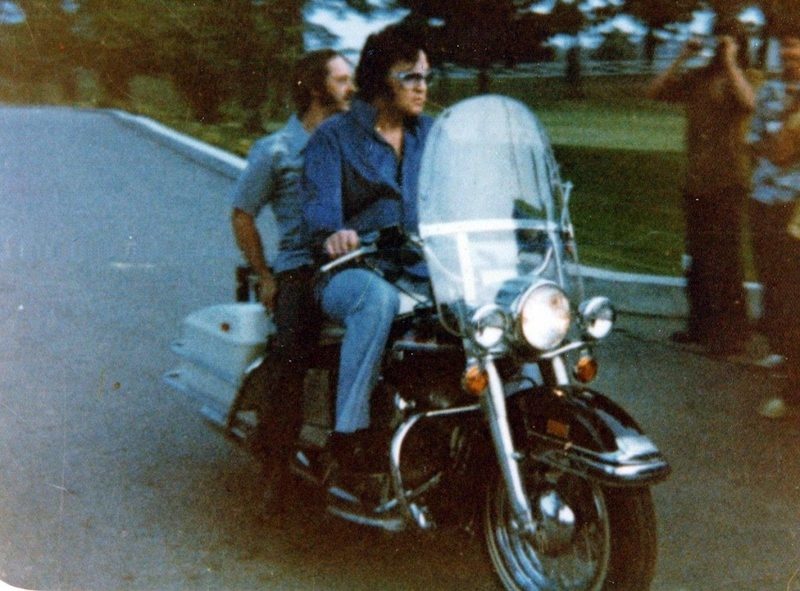 On October 22nd of 1974 Elvis bought his next bike, a black 1975 Harley-Davidson FLH 1200. 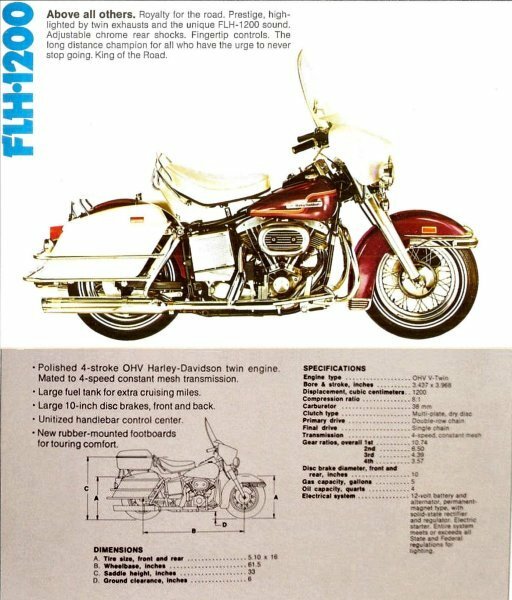 Though still an Electra-Glide, the only touring model offered by Harley to date, the Electra-Glide name is not on the bike and didn't appear to be advertised as much at this time. 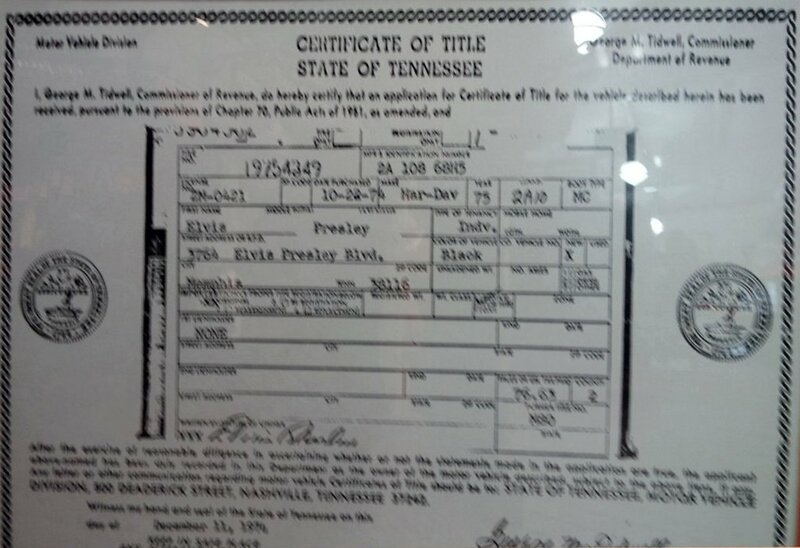 The VIN (vehicle Identification number) 2A10868H5 of Elvis' breaks down as follows. 2A is the model designation for FLH, 10,868 is the sequence number, H is the decade code (1970-79), and 5 is for the model season = 1975. Among the colors available for 1975 were Birch White, Black, Sunburst Blue and Vivid Orange.2 Like his 1971, this too he got without the optional "batwing" fairing. It was the first of his Harleys to come equipped with disc brakes (a single disc on both front and rear). 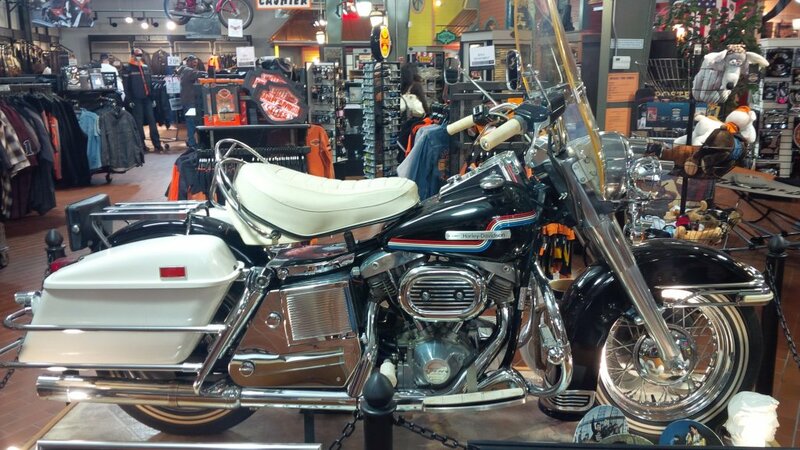 Harley had given the models a front disc first, the weakness most often complained about, in 1972. 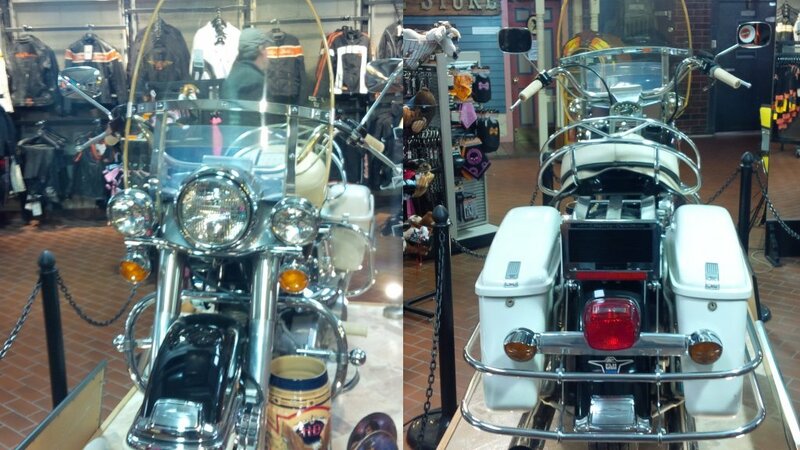 It was also the first bike Elvis bought that was manufactured Pennsyvlvania. The 1975s featured new detailing on the tanks along with a predominant "AMF Harley-Davidson" Logo. The FL series had metal emblems affixed to the tank while the other models had painted logos. 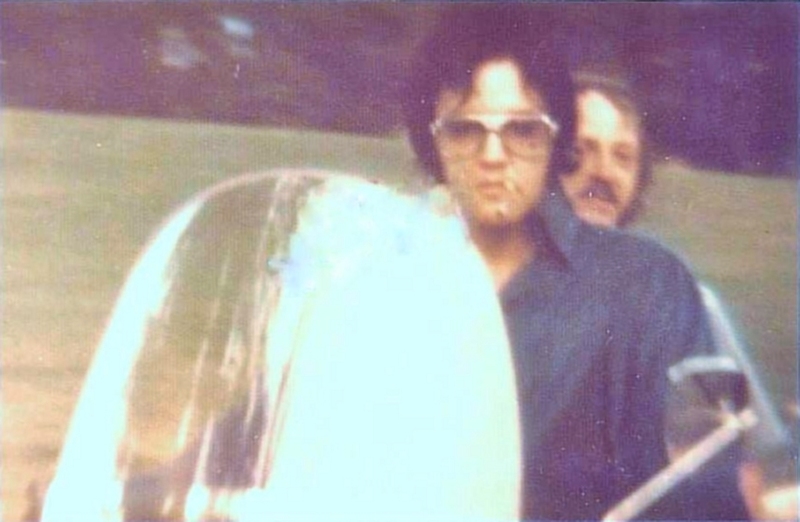 Several pictures of him from September of 1975 show him riding it with his cousin Billy Smith. It was around this time though that his interests started to move to his trikes. This particular bike though is only one of three of his stock Harley-Davidsons he's pictured riding that we actually know the disposition of. The others being his 1956 KH and his 1976 "Liberator." 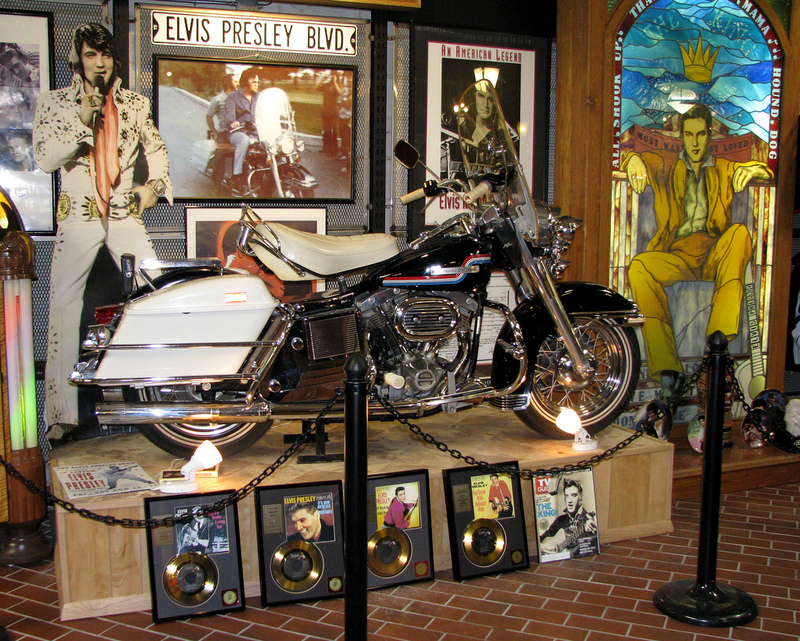 Around the the time of the opening of the Rock and Roll Hall of Fame in 1995, the then owner of the motorcycle took it to Cleveland in hopes of selling it to the museum. The Hall though did not have the funds but Deborah Meyers, whose family owned an area Harley-Davidson dealership, bought it. 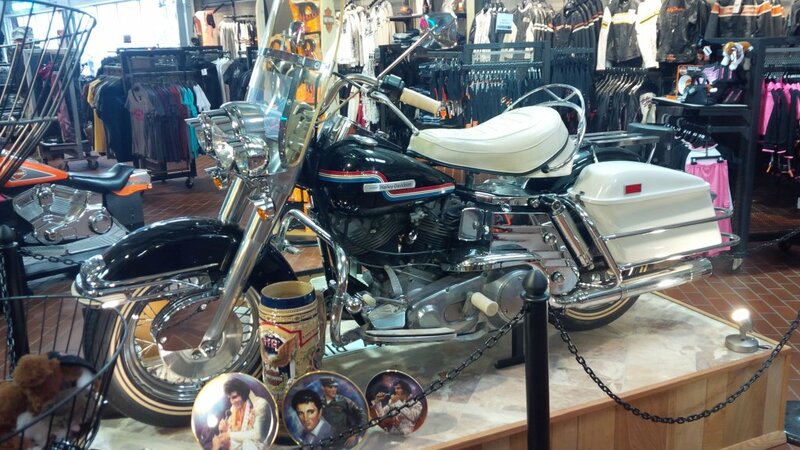 With only 2982 miles on it, Elvis' 1975 Harley-Davidson FLH 1200 has been on display in the showroom there at South East Harley-Davidson in Bedford Heights, Ohio since. Deborah's brother, Paul Meyers Jr., who runs the dealership today said that over the years they've declined many offers to sell it and for the foreseeable there it will remain.